They are so unlike your Christ. The above quote made by Gandhi long time back tells a lot when it comes to the true and original teachings of Jesus Christ, blessed be his soul and what we see around us. 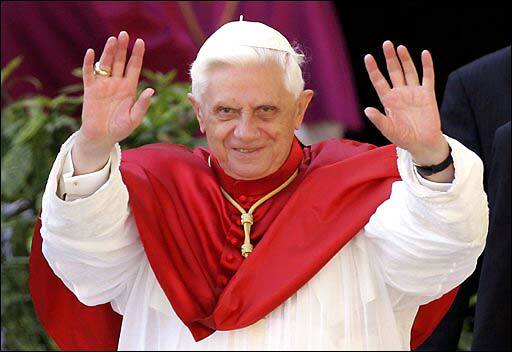 Recently Pope BENEDICT XVI: Joseph Ratzinger made some ill-commnets, quoting an obscure Medieval text that wrongly claim that the teachings of Islam's founder as "evil and inhuman" and unjustly in the speech he implicitly linked Islam and violence. He quoted from a medieval text which said "Show me just what Muhammad brought that was new, and there you will find things only evil and inhuman, such as his command to spread by the sword the faith he preached". (full text of pope's address) The comment generated tremendous protest and condemnation from all over the world not only by Muslims but also by Christian leaders. Following the event in the media i was sad for two reasons. One is the lack of education and respect about another faith from the part of an important figure like Pope and also the media depiction of the response by the protestors. i was saddened to see, there are no media coverage of scholarly, moderate voices from islamic world. all we see is that angry, fanatics are protesting in some concentration camps (made by israel) in occupied palestinian city. This again reflects how gross mis-conception and mis-representation is out there when it comes to understand another faith. Now what i find more disturbing is the irresponsible comment from the part of a person who should have the best knowledge and who will be leading humanity to unite in understanding each other's faith in a time as ours. Unlike Christ who came to unite humanity in the love of God, this is a man who from his dress to his speech is very unlike our Beloved Christ. The part of the quote that triggered most of the protest by Muslims was "Show me just what Muhammad brought that was new, and there you will find things only evil and inhuman ..."
That is total mis-representation of a personality in the human history whom Michael H. Hart's book "The 100: A Ranking of the Most Influential Persons in History" it was the Prophet Muhammad who was ranked 1 because of his tremendous character, ability to transform a nation and take them out from age of darkness to become one of the greatest civilization that human race has ever witnessed. As Jesus Christ says, You shall know by the fruits (Matthew 7:16)... so lets see the what fruits did Prophet Muhammad, peace be upon him brought new to human race. Perhaps Pope will understand the fruits better, since Jesus asked us to know by the fruits (by the contribution, the transformations), rather than biased preconceived notions. Bernard Lewis believes the advent of Islam in a sense was a revolution which only partially succeeded after long struggles due to tensions between the new religion and very old societies in the countries that the Muslims conquered. He thinks that one such area of tension was a consequence of what he sees as the egalitarian nature of Islamic doctrine. Lewis believes that "the equality of Islam is limited to free adult male Muslims," but according to him "even this represented a very considerable advance on the practice of both the Greco-Roman and the ancient Iranian world. Islam from the first denounced aristocratic privilege, rejected hierarchy, and adopted a formula of the career open to the talents." John Esposito sees Muhammad as a reformer who did away with many of the terrible practices of the pagan Arabs. He states that Muhammad's "insistence that each person was personally accountable not to tribal customary law but to an overriding divine law shook the very foundations of Arabian society... Muhammad proclaimed a sweeping program of religious and social reform that affected religious belief and practices, business contracts and practices, male-female and family relations.". Esposito holds that the Qur'an's reforms consists of 'regulations or moral guidance that limit or redefine rather than prohibit or replace existing practices.' He cites slavery and women's status as two examples. According to scholars such as William Montgomery Watt, Muhammad was both a social and moral reformer in his day and generation. He claims Muhammad created a "new system of social security and a new family structure, both of which were a vast improvement on what went before. By taking what was best in the morality of the nomad and adapting it for settled communities, he established a religious and social framework for the life of many races of men." Although slavery was not abolished, but Schimmel asserts that as the reforms seriously limited the supply of new slaves, slavery would be theoretically abolished with the expansion of Islam. John Esposito states that the reforms affected marriage, divorce, and inheritance. "Marriage was a contract, with women entitled to their dower (4:4). Polygamy was restricted (4:3), men were commanded to treat their wives fairly and equally (4:129). Women were given inheritance rights in a patriarchal society that had previously restricted inheritance to male relatives." Watt believes that Islam is still, in many ways, a man’s religion however states that Muhammad, in the historical context of his time, can be seen as a figure who testified on behalf of women’s rights and improved things quite a lot. ... Muhammad however by "instituting rights of property ownership, inheritance, education and divorce, gave women certain basic safeguards." And this was happenning all at a time when Christian Europe was in dark age, never heard of woman rights what so ever. Rather Catholics were burning women in the name of religion accusing them witches. In the next post, God willing i would like to focus how scholars and historians judge the fruits of Muhammad in the historical context. May God bless Prophet Muhammad and his holy bloodline as God has blessed Abraham and his holy bloodline.